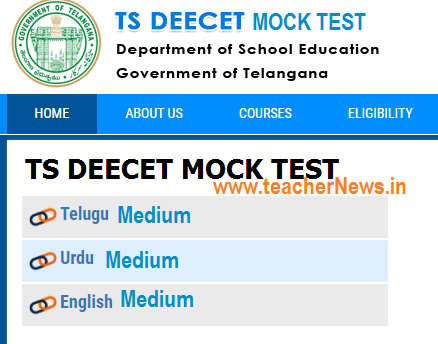 TS DEECET 2018 Online Mock test Computer Based Test (CBT) Instructions : TS DEECET Subject wise and Medium wise Online Mock Tests for attending Computer Based Test and Instructions 2018. DEECET DIETCET Online Mock Test for District Institutes of Education and Training Colleges to District Elementary Teacher Training Institutes Common Entrance Test in Telangana. TS DEECET Online Grand Mock Test TS DEECET 2018 guidelines on Online Computer Based Entrance Test to Candidates, TS DEECET 2018 Online Exam Guidelines download here. TS DEECET 2018 CBT Guidelines for Candidates and Telangana DEECET Computer Test Instructions TS DEECET 2018 Online Exam Guidelines TS DEECET 2018 CBT Instructions TS DEECET Computer Based Test Instructions for Candidates. TS DEECET 2018 Online Computer Based Entrance Test Guidelines For DEECET Examination guidelines to candidates. TS Dietcet 2018 Online Examination will be conducted from 01-06-2018. Telangana School Education Department decided to conduct TS DEECET 2018 Entrance Exam through Computer Based Test (CBT) and DSE AP has given instructions on Computer Based Test to DEECET 2018 applied candidates. Read the instructions printed on the Hall Ticket. Without fail, every candidate should attempt the computer based mock test available at http://www.deecet.cdse.telangana.gov.in. 6. In this page, click on radio button( for accept terms and conditions before proceeding and after click on the "I am ready to begin"
1. Upon receipt of Hall Ticket, check for the following details. 2. Exam details including the date and time of the exam, Hall Ticket number and exam venue. 4. Read the instructions printed on the Hall Ticket. 5. Without fail, every candidate should attempt the computer based mock test available at http://www.deecet.cdse.telangana.gov.in. Session two Starts from 2.30 PM to 5.00 PM duration would be 150 Minutes for each session. Candidates are requested to report to venue before 09:00. AM for forenoon session, and 01:30 PM for afternoon session and will not be allowed after designated time mentioned above. TS DEECET 2018 Online Mock test Computer Based Test (CBT) Instructions, TS DEECET Subject wise and Medium wise Online Mock Tests for attending Computer Based Test 2018.